A Friday night that had a little of everything made for a very entertaining evening from the New York Ranger and New York Islander prospects as there were 6 performances worthy of stars and a couple of highlight reel plays. A night that featured a hockey doubleheader on the Big 10 Network while a couple of other matchups that made trying to pick which games to watch tough calls. When the Saginaw Spirit traded for defenseman Jesse Graham (NYI 2012 6th), it was to add some offense to the Saginaw blueline. The offense has not been as consistent as the Spirit were perhaps looking for but on Friday night, Graham had a career night with his first OHL hat trick as part of a 4 point night to spark a 7-0 win over the Belleville Bulls. The game's First Star," Graham's first career hat trick was made up of goals in each of the 3 periods. In the first Graham would score the only goal that his Spirit would need when Graham registered his 8th goal of the season on the power play at 6:05. The Spirit would take a 2-0 lead into the first intermission and Graham would make it a 3-0 lead oh his 9th goal of the season just 43 seconds into the 2nd period on an even strength goal. Graham would tack on a secondary assist on Saginaw's 6th goal of the game. In the 3rd period, Graham would complete the hat trick when he scored his 10th goal of the season at 11:54 on an even strength goal. Graham since joining the Spirit is 4-18-22 and 10-29-39 overall on the season. Think it is safe to say that Mackenzie Skapski's (NYR 2013 6th) slump is over as the Kootenay Ice goalie earned the "First Star" of the game honors by stopping 30 out of 31 shots to lead Kootenay to a 4-1 win over the Prince Albert Raiders. It was Skapski's 5th straight win in nets and other than the 2nd period goal that Prince Albert scored, Skapski looked really sharp in net. Skapski improved to 16-13-2-1 with a 2.85 goals against and a 0.915 percent save percentage. Kootenay who currently sits in the 8th spot in the WHL's Western Conference standings is just 2 points behind Brandon (5th place) who sit in the WHL's Eastern Conference. 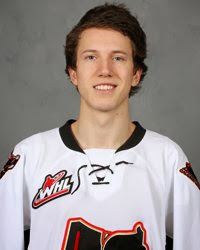 Adam Tambellini's (NYR 2013 3rd) 4th goal of the season gave his Calgary Hitmen at 12:26 of the 3rd period gave his team a 5-3 lead that would turn into a 7-4 win over Ryan Pulock (NYI 2013 1st) and his Brandon Wheat Kings. The game's 2nd star, Tambellini also set up Greg Chase's goal at 5:32 of the same period which broke a 3-3 tie and put the Hitmen ahead for good. Tambellini who was 1-1-2 +4 is now 4-9-13 in 10 games with the Hitmen, helped his team keep pace with the Edmonton Oil Kings who also won. Ryan Pulock (NYI 2013 1st) was scoreless in his Brandon Wheat King's 7-4 loss to Calgary. The loss knocked Brandon out of 1st place in the WHL's Central Division and all the way down to 5th in the conference. 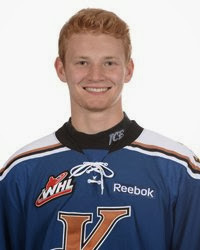 Kyle Burroughs (NYI 2013 6th) had a 1-1-2 +3 evening to help his Regina Pats to a 6-0 spanking of the Saskatoon Blades. Burroughs recorded his 4th goal of the season at 10:03 of the 2nd period on Regina's 2nd goal of the game. Burroughs would also added his 26th assist to improve to 4-26-30. Anthony Duclair (NYR 2013 3rd) had a 1-2-3 -2 evening but his Quebec Remparts saw their 7 game winning streak come to an end 6-4 at the hands of the Blainville-Boisbriand Armada. While Duclair scored his 45th goal of the season while it was still a game; his other 2 points (2 primary assists) really came after the outcome of the game was already determined. Duclair is now 45-40-85 on the season as he now has a 7 game scoring streak (9-11-20) and finishes the month with 14-14-28 for the month. Troy Donnay (NYR 2013 1st) had an assist while teammate Adam Pelech (NYI 2011 3rd) was scoreless as their Erie Otters jumped out to a 3-0 lead and then held on for a 4-3 win over the Owen Sound Attack. Donnay is 1-13-14 on the season as the Erie Otters earned their 4th straight win. Brady Skjei's (NYR 2012 1st) shot from the point was redirected into the Michigan State net to tie the game up at 2-2 late in the 3rd period as top ranked Minnesota went to an overtime tie (Michigan State won the shootout round 2-1 to pick up the extra point). For Skjei the assist was his 4th on the season and 7th overall point. Teammates Jake Bischoff (NYI 2012 7th) and Taylor Cammarata (NYI 2013 3rd) were both scoreless but Cammarata had a beauty of a goal during the shootout portion. Cristoval Nieves (NYR 2012 2nd) had the primary assist on Michigan's 1st goal of the game as his 12th ranked Michigan Wolverines knocked off 9th ranked Wisconsin 3-1. For Nieves, it was his 9th assist of the season and his 10th overall point. Griffin Reinhart (NYI 2012 1st) had an assist on his Edmonton Oil King's 2nd goal of the game as the Oil Kings defeated the Tri-City Americans. Steven Fogarty (NYR 2011 3rd) was scoreless on no shots as his 14th ranked Notre Dame Fighting Irish lost to New Hampshire 4-2. Ryan Graves (NYR 2013 4th) and his Val-d'Or Foreurs were shut out 2-0 by the Saint John Sea Dogs. Graves took 4 shots, registered 1 hit and had a "delay of game" minor. Doyle Somerby (NYI 2012 5th) was scoreless as his Boston University Terriers and UMass Amherst Minutemen played to a 3-3 overtime tie. Somerby was scoreless on zero shots and a -1. Eamon McAdam (NYI 2013 3rd) saw his season's record drop to 0-9 as his Penn State Nittnay Lions lost to Ohio State 5-1. Got to feel for McAdam who gave up 4 goals on 27 shots as the question is will the freshman goalie win a game this season or not? Victor Crus Rydberg (NYI 2013 5th) was a scoreless and a -2 as his Plymouth Whalers dropped a 3-2 decision to the Kingston Frontenacs. Stephon Williams (NYI 2013 4th) was the backup goalie for his Minnesota State Mavericks.